Bullet hell games, we love'em don't we? Right? RIGHT? Well we do when they are lefty-righty or up and downey 2D games. But what if you put that same mechanic and put it into an FPS game? Yes, I made that face too when I first heard about Mothergunship but I became a believer when I experienced it for myself at PAX West 2017. The concept seems profoundly wrong, yet there I was playing that very thing at the Indie Megabooth. Aliens have invaded Earth and it is up to you, a lowly tree-frog, to eliminate these beings by dodging their ever so slow moving bullets as they fire hundreds of them at you and hardly any speed at all. But there are loads of them. Did I mention that you play a tree-frog? Well you do. No I'm being serious, not like Mothergunship, which isn't. At all. I believe there are two key aspects of Mothergunship that make it quite notable. 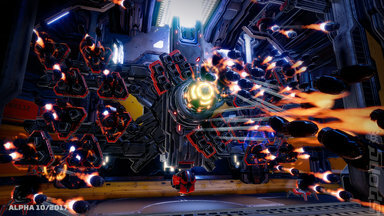 Yes, there are the first-person shooting mechanics with enemies filling the screen with exceptionally slow moving projectiles. Seriously, your character can actually outrun them in most instances. But there is also the crafting mechanic that up until three words ago I had yet to mention. 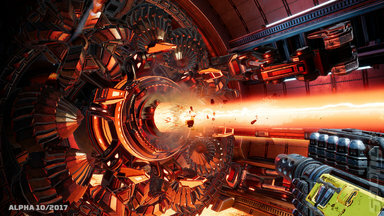 Mothergunship delves into the realms of survival building games by allowing players to build their own weapons. This builds on the concept of upgrades for ship abilities and weapons in games like Gradius and R-Type.The difference here is that the form of the weapons is entirely up the player. But there is a cost to building extravagant weapons. For every barrel and rocket launcher you install, more energy is spent. It is therefore possible to make a weapon array that wraps around the entire perimeter of the screen, but you can only fire it once every 30 second as it takes that long to recharge! 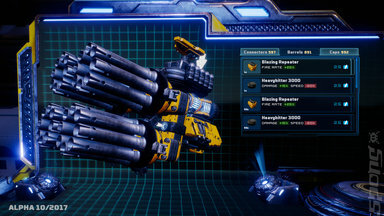 It's a great idea that forces the player to balance damage vs fire rate and I had a great time building very strange weapons, all with the aim of unleashing hell with them. As you may have gathered by now I really liked Mothergunship and I am very much looking forward to its release. Mothergunship is due to appear sometime in 2018 on the PS4, Xbox One, Windows PC, Mac and Linux.